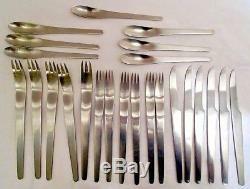 A partial set of 25 pcs Arne Jacobsen Stainless Steel flatware, Satin, by Georg Jensen, Denmark. 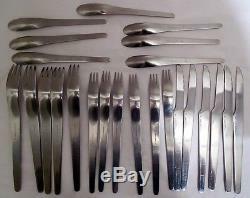 The item "A partial set (25 pcs) of Arne Jacobsen stainless steel flatware, Georg Jensen" is in sale since Monday, September 10, 2018. This item is in the category "Antiques\Silver\Silverplate\Flatware & Silverware". The seller is "albionant" and is located in Marietta, Georgia. This item can be shipped worldwide.